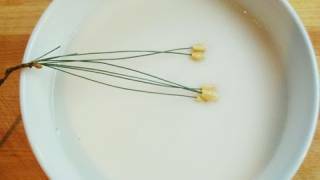 Pine nuts, rice, salt, and water. Soak ⅓ cup of short-grain rice in cold water for 1-2 hours. Rinse and drain and put it into a blender. Add 2 tbs pine nuts (with the tips removed) and 2 cups of water to the blender. Blend the mixture finely for about 3 minutes, until it turns into a milky white liquid. Pour the liquid into a heavy bottomed pot. Cook it over medium high heat. Keep stirring with a wooden spoon. It’ll get thicker in about 3 minutes. Add ½ ts of kosher salt, lower the heat to medium low, and stir for 5 more minutes. The porridge will get thinner and a little soupy. 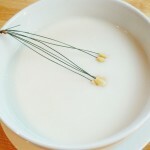 Transfer the finished porridge to a serving bowl and garnish with a few pine nuts on top. Posted on Tuesday, January 18th, 2011 at 12:56 pm. Last updated on April 26, 2015. Posted April 17th, 2015 at 9:01 pm | Log in to reply. Can I use glutinuous rice flour instead of rice? If so, how do I use it? Posted November 21st, 2014 at 10:51 am | Log in to reply. Maangchi! Thank you for this recipe and your very clear instructions. I have been thinking about this dish since I first watched your video, and I finally made it last night. I used walnuts instead of pine nuts — would I call that “hodujuk”? — so it wasn’t the beautiful creamy color yours was, but the flavor and texture was very good. I will definitely make this again. Posted November 23rd, 2014 at 10:18 am | Log in to reply. Sounds like you invented a new Korean dish! Posted November 9th, 2014 at 1:01 pm | Log in to reply. I’m eating juk right now as I type this. I used your recipe, but modified it a little using my rice pudding recipe (because I didn’t have pine nuts). I followed your instructions, but rather than adding salt, I added three tablespoons of sugar, a 1/2 teaspoon of vanilla extract, and a teaspoon of cinnamon. And rather than 2 cups of water, I used 1 1/2 cups of water and 1/2 cup of cream. After the juk thickened up (anyone that tries this recipe, be patient, it does thicken quite nicely). I put in a bowl and garnished it with raisins, slivered almonds, and another dash of cinnamon. I’m in heaven right now! Thank you for this recipe. I plan to experiment more with it! Posted July 19th, 2014 at 2:51 am | Log in to reply. Maangchi, thank you so much for this site!! I had to comment when I saw this recipe for jatjuk. A few months ago, I watched a Korean drama called Jewel in the Palace/Dae Jang Geum (Korean: 대장금) and that really got me interested in Korean cuisine. There is a part in the show where the main character, Jang-Geum, is in a competition to see who can thread the most pine needles and pine nuts in the dark. This video made me think of that! I hope I can try out one of your recipes very soon. I just need to pick one and get the ingredients. Thank you for sharing your talents with us! Posted July 19th, 2014 at 9:57 am | Log in to reply. You are so ready to start Korean cooking now! Good luck with your Korean cooking! Let me know how it goes. Posted November 29th, 2013 at 4:06 am | Log in to reply. Why do you remove the tips? Posted December 1st, 2013 at 7:52 pm | Log in to reply. It looks better that way. You can leave them in if you want to. Posted October 23rd, 2013 at 4:32 pm | Log in to reply. Hi, for the Rice, can i use normal or even calrose rice (sushi rice)? Posted November 19th, 2013 at 2:25 pm | Log in to reply. short grain rice is the same as sushi rice. Posted February 7th, 2013 at 5:31 pm | Log in to reply. I think this porridge can taste funny with some chocolate or vanille. Posted February 9th, 2013 at 12:04 pm | Log in to reply. Posted December 27th, 2012 at 11:57 am | Log in to reply. This was AMAZING! Perfect flavor and consistency! I have been using this recipe for many years. I can make jatjuk very easily. I’m glad to hear that you enjoyed this recipe, too! Happy cooking! Posted June 23rd, 2012 at 9:24 am | Log in to reply. I just made this after a really bad day, and it is so good and calming! That you, Maanchi. :) It was also a really good arm work out – I will have biceps in no time if I make this regularly! Mine came out a little thick – I made two servings, so maybe I measured out too much rice! The taste is great, though. I now have a substitute for kongguksu when it gets cold outside. :) (I eat your kongguksu recipe every day! I love it so much, and I never get tired of it!) I am so glad you share your recipes with the world! Posted June 24th, 2012 at 6:50 am | Log in to reply. Thank you for your update! Check out the step 7 in this recipe please. Posted June 6th, 2012 at 10:03 am | Log in to reply. Posted November 27th, 2011 at 2:06 am | Log in to reply. I made this using long grain rice and Italian pine nuts. I had a hard time finding pine nuts, by the way. I eventually found some at a Food Emporium on the Upper West Side. Anyway, I wanted a thicker porridge so I didn’t grind the rice and pine nuts too fine. I ended up with a porridge the consistency of rice pudding. It was also a little beige, but that might be because I used long grain instead of short grain rice. Posted November 28th, 2011 at 5:15 am | Log in to reply. Next time if you make it again, use short grain rice. It will be more delicious. Posted August 8th, 2011 at 12:02 am | Log in to reply. Posted August 8th, 2011 at 9:57 am | Log in to reply. Posted July 19th, 2011 at 3:28 am | Log in to reply. Could you use milk in this instead of water? How much would you use? Posted July 19th, 2011 at 11:06 am | Log in to reply. Posted July 19th, 2011 at 9:22 pm | Log in to reply. Posted July 21st, 2011 at 7:57 am | Log in to reply. I guess I need a real blender. All of the shredded rice was left at the bottom. And the water wouldn’t thicken, just evaporate. It was also very salty, but that was probably because it was mostly water with some starch probably. Thank you for the recipe though. Posted May 10th, 2011 at 6:52 am | Log in to reply. Hi! I was wondering should i add more pine nuts if it’s a little to small? Oh, and also wondering do i decrease all the ingredients portion size if i don’t need to much? Posted April 25th, 2011 at 3:04 pm | Log in to reply. Will this soup taste good a few hours later, if it’s kept in a thermos? Posted April 26th, 2011 at 11:52 am | Log in to reply. Anna, yes, you can keep it hot in a thermos and eat it in a few hours. It will still be delicious. This recipe was originally posted on January 18, 2011 at 12:56 pm by Maangchi. It was last updated on April 26, 2015. The video was watched 129,149 times on YouTube & has 1,264 likes!